Stina Tweeddale has a new album coming in out and will be touring to Yorkshire in May and June. Honeyblood’s new album, In Plain Sight, marks a point of departure for Scottish musician Stina Tweeddale. 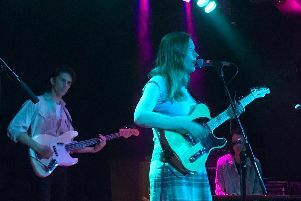 Not only is the record a stylistic step forward from its two garage-rock influenced predecessors, it’s also Tweeddale’s first as a solo artist. Previously she had worked in a duo, first with drummer Shona McVicar, then on their self-titled album and its successor Babes Never Die, with Cat Myers. Parting ways with her bandmate had been on the cards when Myers accepted a job touring with Mogwai. “That was for a full year so that meant I was kind of at home twiddling my thumbs, thinking about what was going to happen with the next record,” says Tweeddale. “I wrote 30 songs while Cat was away. We did do some writing together but it was very short because she was so busy, so it really did feel like I was writing this as a solo record. “I had recently moved house into a bit more isolated area and was very much stuck in my little bubble, and when Cat came back off that tour she actually got offered another tour. Cat’s such a great drummer and an ambitious musician and it was going to be very difficult for us to juggle all those things together. I think it came to a natural progression where I need to dedicate 100 per cent to this and unfortunately it seemed like I couldn’t ask the same of other people. In LA she worked with John Congleton, who’s produced records with the likes of St Vincent, Angel Olsen and Sharon Van Etten. His preference for working “really, really fast” chimed with Tweeddale – they finished the record in nine days. Last year Honeyblood toured with Garbage – at the request of singer Shirley Manson. For Tweeddale, it was an affirmation. “She’s such a huge legend and an inspiration to me, I’ve listened to Garbage for decades.